Do you ever think you might just turn into a big leafy green if you eat one more boring salad? I sure do, especially since I've been upping my produce game lately. I've made a bad (healthy, but boring) habit of eating the same salad every day for lunch at work, and it's so much harder to eat a cold salad when it's chilly outside. Monday night, I planned to eat my Potato Leek soup with a little side salad. Instead, I ended up cleaning out my fridge and produce bowl, and whipping up this delicious, warm Grilled Steak Salad. The cool lettuce in contrast to the warm steak, grilled onions and tomatoes, sweet balsamic, and creamy cheese is a real winner. I used a tangy garlic and herb Boursin cheese since I had it on hand, but goat cheese or blue cheese would also work wonders. Preheat a grill pan over medium heat. Spray generously with olive oil cooking spray and add onions and tomatoes. Season with salt and pepper, and cook until the tomatoes have light grill marks and the onions are translucent. Set aside. Pat the steak dry with a paper towel. Season generously with salt and pepper, add more cooking spray to the grill pan, and then add the steak. Cook to your preference (for my thin cut steak, I cooked it three minutes per side). To serve, slice the steak thinly against the grain. Spray the lettuce very lightly with olive oil spray (you can skip this step if you prefer - the balsamic reduction adds lots of flavor). 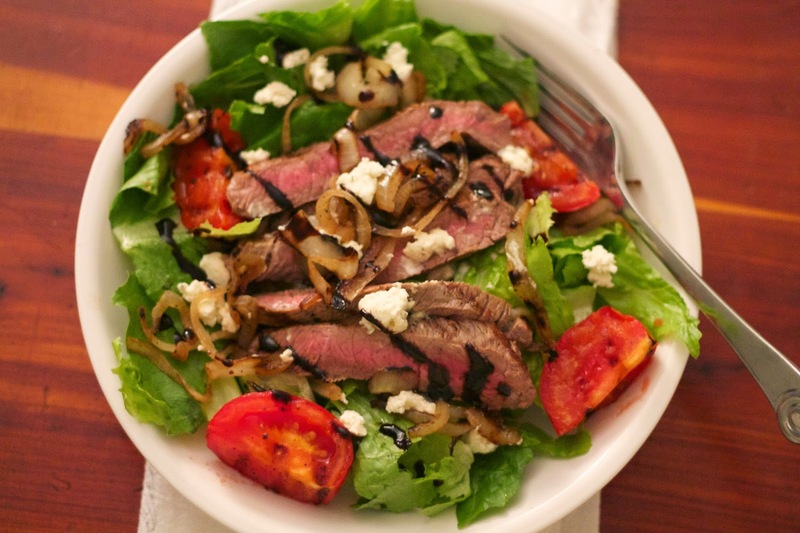 Top the lettuce with steak, onions, tomatoes, crumbled Boursin, and drizzle lightly with balsamic reduction. Serve warm. Enjoy!